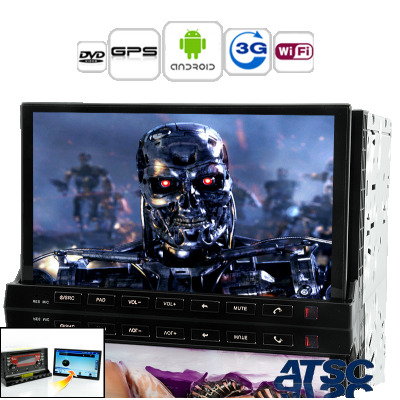 Successfully Added In-Dash Car DVD "Road Terminator" - Detachable Android Tablet, GPS, 3G, WiFi, ATSC (2 DIN) to your Shopping Cart. 2DIN Android 2.3 Car DVD Player featuring GPS, ATSC and 3G capabilities as well as a detachable 7 Inch LCD front panel that doubles up as a portable tablet. "Hasta la vista, baby”, this “Road Terminator” media player offers you the best of two worlds by combining a car DVD player and a removable front panel that doubles up as a 7 inch tablet. It’s a combination of an in dash Car DVD with a detachable 7 Inch Android 2.3 Tablet, robustly constructed and with a stylish appearance. Adding to a Car DVD a detachable Android Tablet, which at the same time serves as the touch panel, the “Road Terminator” is virtually the most powerful and versatile electronic in car entertainment device around. With the Android 2.3 Gingerbread operating system that is pre-installed, you’ll get access to thousands of apps and games on the official Android Marketplace and you’ll be able to surf the internet through 3G or Wi-Fi, and play games. This “Road Terminator” 7 Inch Touchscreen Car DVD Player features an amazing 800 x 480 pixel screen resolution to make disks and videos played on this remarkable system come out crystal clear and visually brilliant. Watch MPEG-4 compressed DVB-T on its amazing screen. With Digital TV, movies, shows, and news are always free and available direct to your car. This multi-purpose entertainment car DVD player even has a powerful region free DVD disk player that can play DVD's from any country. As well as having the ability to receive ATSC (MPEG-4 Standard) and Radio programs while also you can enjoy playing music and movies directly from a TF card. In addition with its detachable Android 2.3 Tablet, you can surf the internet, play games, and watch YouTube videos. It handles the Internet's most popular video and audio file formats like MPEG 1/2, AVI, DIVX, XVID and MP3 with little burden. Attach an iPod or portable media player to the “Road Terminator” and have plug and play access to your entire media collection. Also the users can take advantage of the Bluetooth capabilities for handsfree communication. This “Road Terminator” is a perfect 2DIN car DVD player with a removeable front panel that doublkes up as a 7 inch screen tablet. In stock, and if ordered can be shipped out within 24 hours with a 12 month warranty. This amazing in-car total solution is brought to you by the leaders of electronic devices and car DVD players, Chinavasion. On online direct from China wholesale car DVD players , Chinavasion. The front panel while detached is a fully functional android tablet. You can take it home first of all to prevent theft, second to use it as a Tablet PC. This product supports 3G internet through an external dongle (not included). Networks supported include WCDMA, EVDO and TD-SCDMA. This product supports the ATSC digital TV standard, which is not used worldwide. I order the Road Terminator and it showed up in Florida within 3 days via DHL, I haven't got over how fast this was delivered. The radio I have installed yet, as I'm waiting on other trim parts for the installation. This is going into a 2007 Ram 1500 with an Earthquake Amp 125W RMS a channel driving Infinity 6X9 pair, 6'' Co-ax Pair and 2.5'' Co-ax Dash pair, with a 500W RMS Dual 10'' Woofer under rear seat. I'll post a second update after the system is installed and let you know how the rest of Road Terminator turns out. I was a bit concerned over one of the reviews stating they didn't like the resistive touch screen and I will admit it works better with the styles, but for a car radio I don't think it is going to be an issue.